Bill and Joe Feinberg, owners of Allied Kitchen & Bath, purchased a block of buildings two years ago on 34th Avenue in Oakland Park to use as a warehouse for their showroom on Oakland Park Boulevard. But the city had other ideas. No warehouses were permitted because the city hired Redevelopment Management Associates, the same company that re-envisioned downtown Delray Beach, to create a Culinary Arts District. 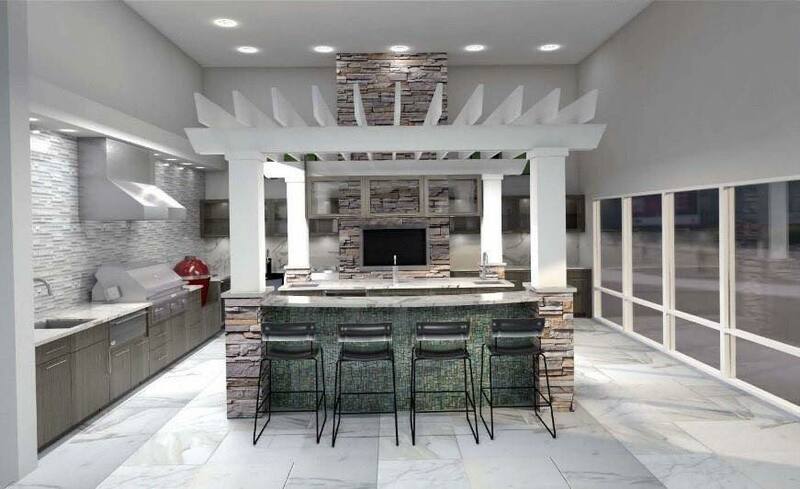 This change was the incentive for Allied’s new 10,000-square-foot showroom for 26 indoor and outdoor kitchen designs, opening on Friday (4/22). Allied will lease the remaining buildings to restaurants and other food oriented tenants. The brothers are now partners with Monarch Premium Appliance Company to offer high-end kitchen brands such as Sub-Zero, Wolf, Viking, Miele, KitchenAid, Dacor and Thermador. Melissa Mailley, who was hired a year ago, designed the innovative kitchens that mix a variety of textures not often seen in South Florida. The hip, creative and contemporary designs, will appeal to a younger clientele and Europeans. “Melissa, who is French Canadian, has a different design style with fresh ideas,” Bill Feinberg says. One of the key elements in the outdoor kitchens is Brown Jordan’s stainless steel cabinets with baked-on finishes that resemble bamboo, wood and other textures. She also used new products from Dekton, which produces surfaces for countertops and walls that look like concrete, tile and marble. The outdoor display features a wok station, a built-in pizza oven (made popular in California) and a tabletop pizza oven. One of the most dramatic examples is an indoor white kitchen created with 10 slabs of book matched Dekton that resemble a beautiful marble installation. The original showroom, at 616 W. Oakland Park Blvd., remains open and features kitchen and bath vignettes as well as lighting, tile, hardware and plumbing fixtures. Allied Kitchen & Bath, 3484 NE 12th Ave., Oakland Park, 954-564-1611; alliedkitchenandbath.com.